Now that the painting has had its layer of surface dirt removed, the next step in the treatment is the removal of the varnish layer. A lot of the principles that we talked about with surface cleaning, also apply to the removal of varnish layers. Therefore, prior to beginning it’s important to establish as closely as possible what the varnish or coating is, consider whether it is appropriate to remove it and work out a strategy for removing it safely. 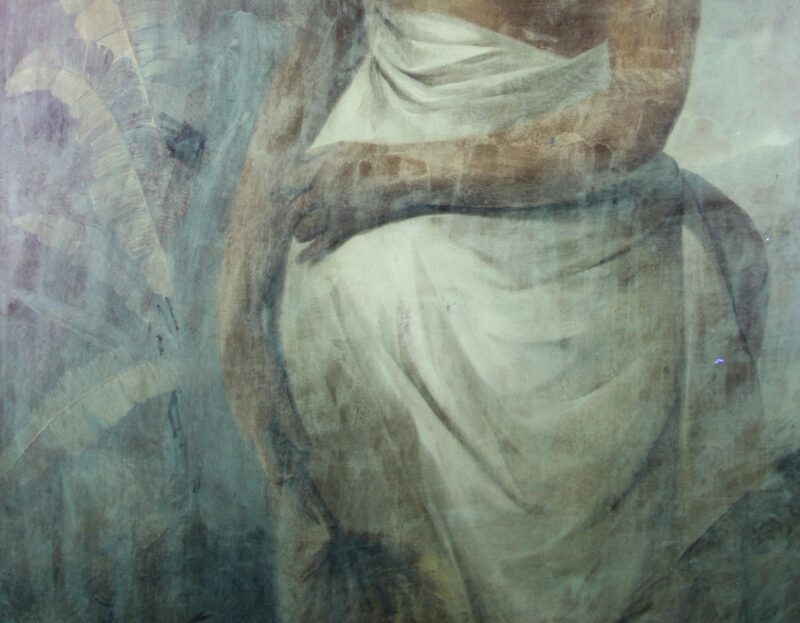 In the case of Poedua, we want to remove the varnish layer because it is very discoloured and has been applied extremely unevenly, which has become more apparent as the discolouration has progressed. 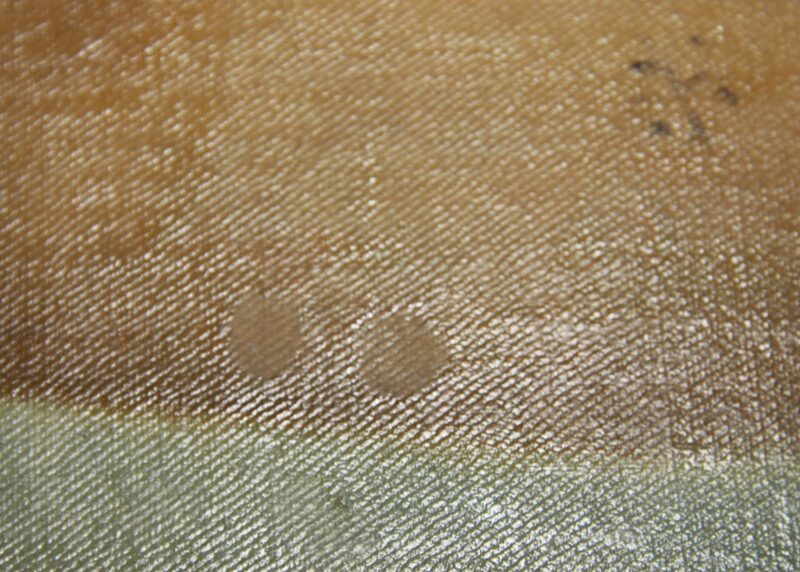 Similar to the effects of surface dirt, the discoloured varnish present has diminished the tonal ranges of the painting. Under UV the uneven application of the varnish becomes really obvious. The bright green fluorescence indicates a natural resin varnish, 2011. Photograph by Mel Carlisle © Te Papa. The first step is to characterise the varnish and work out how many layers are present. 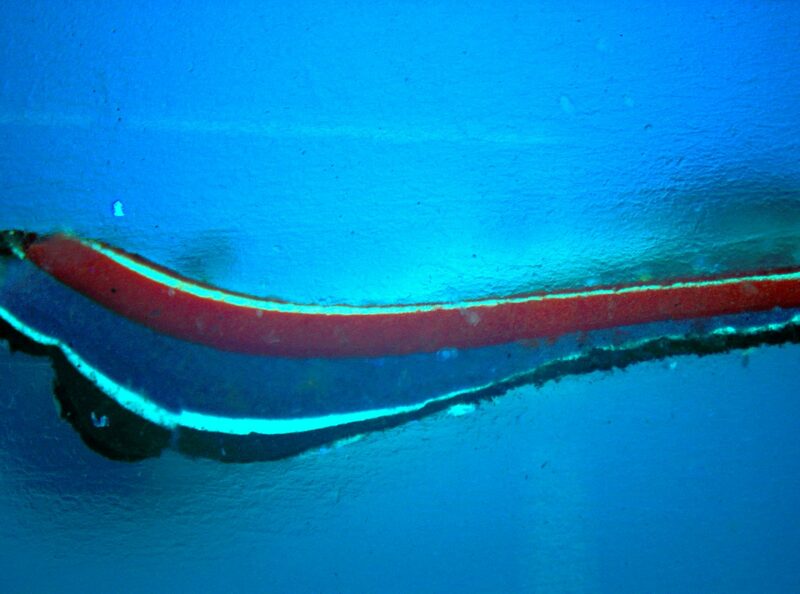 There are several techniques available to us including, exposing the painting to ultraviolet light and taking cross-sections of the paint and varnish layers. Looking at the painting under UV lamps causes specific auto-fluorescence in different materials which helps us with identification. The varnish layer on Poedua fluoresced a bright green colour, indicating a natural resin such as dammar or mastic. This wasn’t surprising to us since both are common varnishes that we might expect to find on a work such as this. Cross-section analysis involves the sampling of a microscopic piece of the painting, usually taken from an area of existing damage. This sample is set in a polyester resin and ground down with fine sand paper. 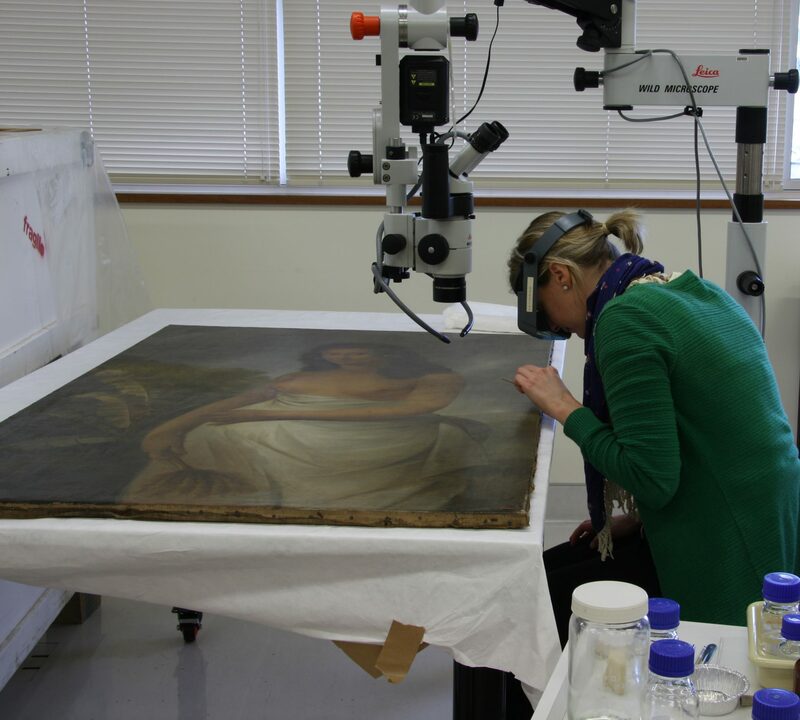 The cross-section is then examined using a compound microscope where we can see the building up of paint layers by the artist, surface coatings and later additions. From the cross-section we took from Poedua we can see that there is only one varnish layer apparent. Once the cross-section has been prepared, we look at it under magnification and also UV to see the build-up of layers used by the artist, 2011. Photograph by Katherine Campbell © Te Papa. This a cross-section taken from a Don Driver painting in Te Papa's collection. 1980-0013-1; Zither; Don Driver. Under magnification and UV it's possible to see several layers of paint and 2 layers that fluoresce with the appearance of varnish. The cross-section was photographed by Sarah Hillary at the Auckland Art Gallery, 2010 © Te Papa. Varnish layers become increasingly difficult to remove the older they are. This is due to alterations in their chemical structure that occur over time. 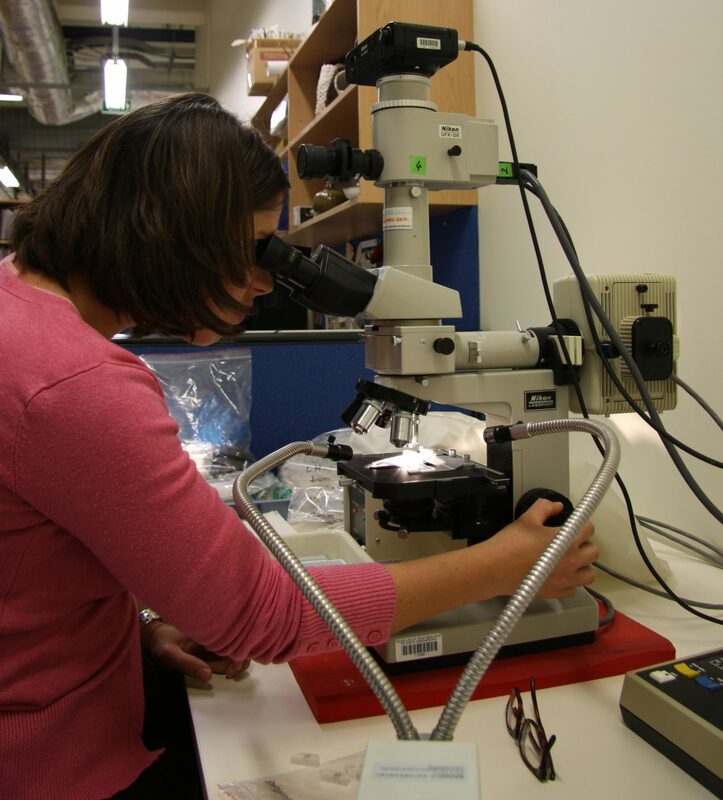 The solvents that conservators use to remove varnishes are carefully tested in a similar manner to the surface cleaning testing. We use a variety of solvent mixtures and different preparations and combinations including enzymes, soaps and gels. Their effectiveness builds further on our knowledge about the varnish layer we are dealing with. Solvents work by penetrating the varnish layer and swelling the film, bringing the resin into solution and allowing it to be removed from the surface. After initial testing, we select the most appropriate solvent or solvent mixture and test this in the various areas of the composition. Constant care and attention is crucial during this process because the varnish layer is usually the last layer before the paint film is encountered. Initial testing is done under magnification so we can closely monitor the results. As with the procedure for surface cleaning swabs are kept along with notes of the results for comparison, 2011. Photograph by Mel Carlisle © Te Papa. Once the pale paints have been tested we move onto all the major areas of colour. The two circular areas that appear dry and matt are the patches where the varnish has been removed and the paint layer is exposed. At the end of the treatment a new varnish layer will be applied which will resaturate and intensify the paint surface again, 2011. Photograph by Katherine Campbell © Te Papa.